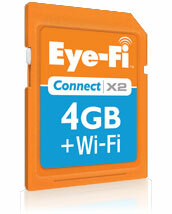 Eye-Fi makes SD cards for your camera with a Wi-Fi radio baked right into their tiny package. We've written about Eye-Fi before, and it's great for uploading photos to your computer or your favorite photo sharing site like Flickr or Picasa. At CES, the company is introducing Direct Mode, a new feature that allows users to send photos and video from their camera to a smartphone or tablet when used in conjunction with the Eye-Fi app. This will allow users to quickly and wirelessly share photos with friends and family even without an Internet connection. You could also beam them to your Android phone or iPad for quick editing before uploading them to a photo sharing site from your mobile device. While almost every smartphone on the market has a camera built in (and camera phones are getting better and better by the day), they still can't match a dedicated point-and-shoot or DSLR in terms of image quality or low light performance. Direct Mode should appeal to those who take their snapshots seriously, but are also impatient when it comes to sharing those images. Direct Mode will be enabled via a software update for its X2 line of cards later this year. Though, Eye-Fi has been a bit cagey about when exactly "later" might be. My husband gave me one of these for Christmas and I love it! I can’t wait for the phone software.